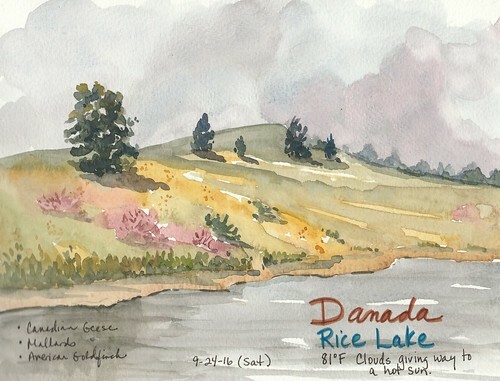 Rice Lake at Danada Forest Preserves Watercolor Sketch – Let's Paint Nature! As the leaves blow by and the air turns slightly cooler, I know it’s a race against time. Autumn is here and it doesn’t like to linger. So I’m trying to get out as much as possible. 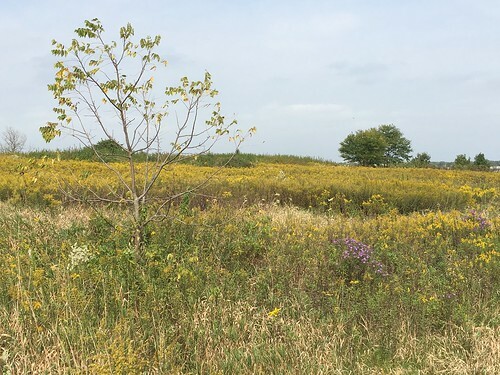 Last Saturday I had the chance to go to Danada Woods a forest preserve in DuPage County. Immediately on their map, I saw what is called the “Nature Trail” and knew that’s where I had to go first. The trail is narrow. You must walk one at a time. And that is perfect for contemplative thinking and a deep appreciation for the abundance of nature, inches away from you. It makes you take note of what’s growing around you instead of gabbing with a friend. The first thing I noticed was this solitary mushroom surrounded by a carpet of moist autumn leaves. 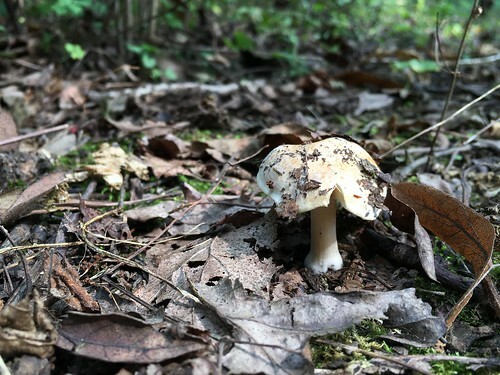 Notice the fragments of dirt, leaves, and sticks on its cap after it emerged from the ground. Beautiful. The trail was exploding with berries: Jack in the Pulpit, False Solomon’s Seal, Honeysuckle, white baneberry, elderberry, and many others. This honeysuckle bush caught my eye because of the color of its berries (unripe ones look like watermelons up close) and because the berries look as if they have no stems. 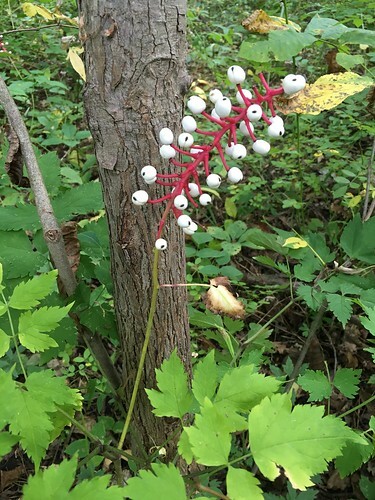 Here is White Baneberry, or more commonly known as Doll’s Eyes. 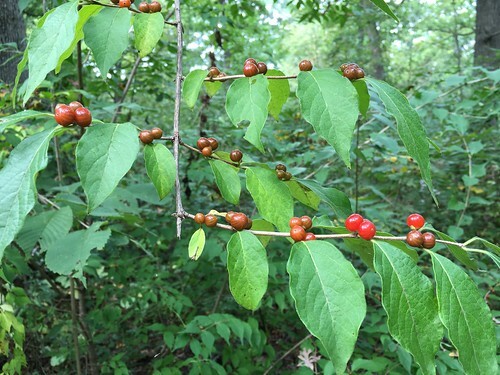 NEVER eat these berries as they are toxic. For humans, all parts of this plant are toxic. Even contact with the leaves may cause irritation for some. But for birds, it has no effect. They eat the berries, dispersing seeds in the woods encouraging new growth. 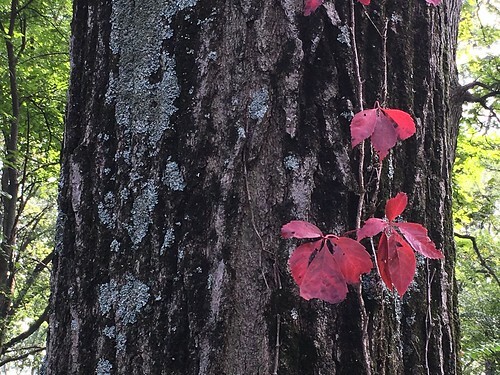 Red Virginia Creeper is striking next to the cool blue color of the Lichen growing on this trunk. 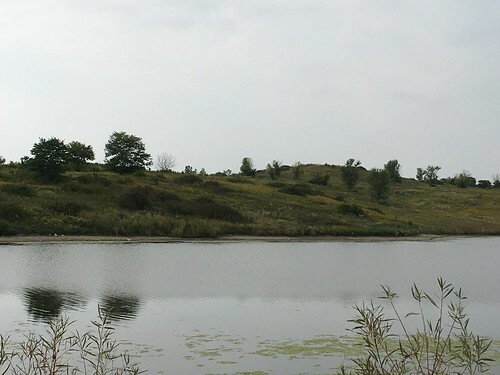 Finally after exiting the Nature Trail, I headed toward Rice Lake. This is a wide open trail and the open landscape is stunning. The sun at this time of day was eating away at the clouds creating holes for the sunlight to escape. Here is where I ended and where I decided to paint…thanks to a nice bench which served as my table. When the sun did emerge, it was a very hot sun. The happy notes of American Goldfinches tweeted above my head as I sat there painting. I am very grateful for this time. I think of it often and it brings me peace. Pretty painting. Nice, interesting photos and information also. I do enjoy the way you write and your pictures are beautiful. A painting of only the tree bark and red vine could be gorgeous. Rosemary, what a great idea! I think I will try it. Thank you for your kind words. Beautiful sketch and I loved the photos! Thanks Alanna! Next year we will hike together!